MILAN ? 3 players from the AC Milan Youth Sector have been called up to the Italy Under-19 squad for a friendly match against Georgia on the 25th of February. Last edited by Sod-Lod; 21-02-2015 at 15:20. 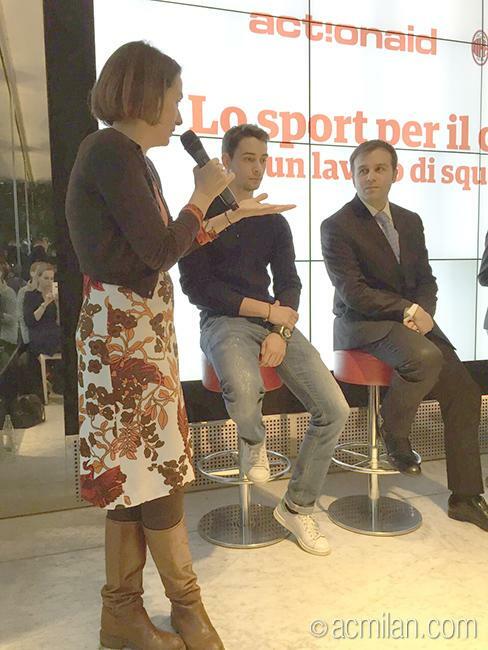 De Sciglio: "My suggestion to the kids is: choose your goal and keep fighting for it"
Marco De Ponte of ActionAid Italia: "Con Fondazione acmilan perche sport sia volano per sensibilizzare i giovani a favore di solidarieta e integrazione sociale"
Rocco Giorgianni of Fondazione Milan: "Lo sport e fondamentale per formazione e crescita dei giovani, soprattutto per chi vive situazioni di difficolta"
Rocco Giorgianni of Fondazione Milan: "Fondazione Ac Milan e onorata di collaborare con ActionAid Italia per combattere discriminazione e esclusione sociale"
Rocco Giorgianni of Fondazione Milan: "Con Lavoro di Squadra rimettiamo al centro lo sport per riattivare e motivare i #NEET. 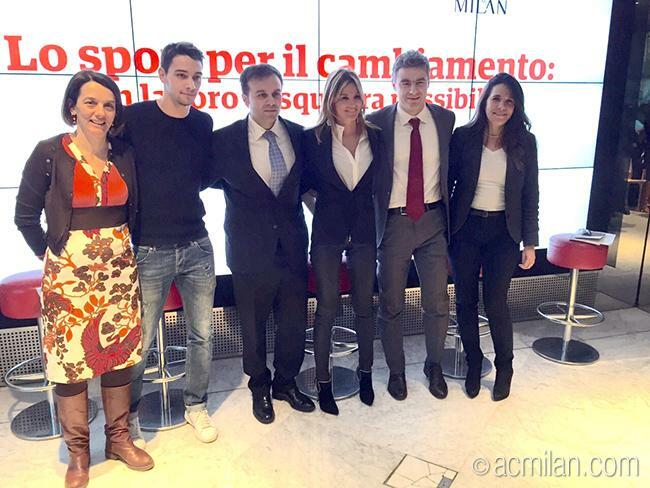 Per questo con noi c'e De Sciglio"
Con Ac Milan e AXA Italia allenamento motivazionale per giovani #NEET dai 15 ai 24 anni nel Comune di Milano per ritrovare fiducia e motivazioni. Last edited by Sod-Lod; 24-02-2015 at 17:33. A lot of different coaches, pundits and people who are responsible for youth at club levels in Italy keep praising the Primavera captain Mastalli and say he is ready and Pippo should take him into consideration. They all say hes a born leader, and is a fantastic professional and role model at such a young age which is hard to find. He might not be the most talented but makes up for it with his character, mentally hes ready. I come up across interviews praising often when I'm reading websites with Milan related news. Galliani: "@Mastalli8 was ready yesterday and would have probably come on, had @NDJ_Official not asked to be taken off"
MILAN – The two groups have been drawn for the International Football Championship tournament in Dubai. The youth tournament is now in its fifth edition and will be taking place from the 9th through to the 21st of April. Milan will be sending a youth sector team made up of players born in 1996 and 1997 and have been put in Group B with Valencia, Shabab and Ahli. All of the group stage matches will be played out at the Dubai Police Officers Club Stadium. The rossoneri’s first match is against Valencia on Saturday the 11th of April at 16.30. On Monday the 13th Milan take on Shabab at 16.30 whereas the third and final group stage match is scheduled for Wednesday the 15th versus Ahli at 19.00. For Italy, the following have all received call-ups: Gori, Mastalli, Mastour, Calabria, Crociata, Felicioli, De Santis, Di Molfetta, Bordi, Vassallo, Vido, Donnarumma, Locatelli, Cutrone, Malberti, Llamas, Iudica, Cantelli, Torrasi, Gabbia, Curto, Plizzari, Bellanova, Cornaggia, Sportelli, Campeol, Vigolo, Bianchi. How are Gori, De Santis, and Locatelli doing this season? nth promissing yet at primavera. Black players from AC Milan's Under-10 team were allegedly subjected to racist abuse from parents during their Universal Cup clash against Paris Saint-Germain on Sunday. The Universal Cup is an annual youth tournament featuring 48 teams from around the world - including Chelsea, Juventus, Inter, Ajax and Benfica - and is currently taking place in Forte dei Marmi in Tuscany. On Sunday, AC Milan's Under-10s played against their PSG equivalents for a place in the semi-finals but their black players were booed and heckled throughout the match by parents on the sidelines. It is not known which team the racist parents were following. 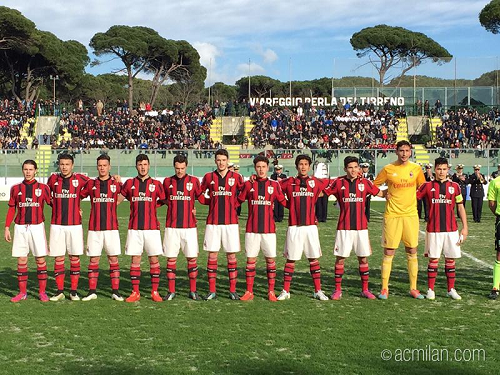 The Rossoneri completed the game, which they won 4-0, but expressed their anger to organisers after the match. They also consoled their black players who had been abused. AC Milan published a statement on their official website, saying: "We can confirm the alleged episodes of racism towards the black children by several 'people' in the stands during Milan v PSG yesterday. "We do not want to amplify or exaggerate anything, but we very much hope that this is not true and that it was just something isolated. If that isn't the case then it would be absolutely unacceptable." Football agent Mino Raiola condemned the abuse on his official twitter account, labelling the hecklers as "weak, ignorant racists."